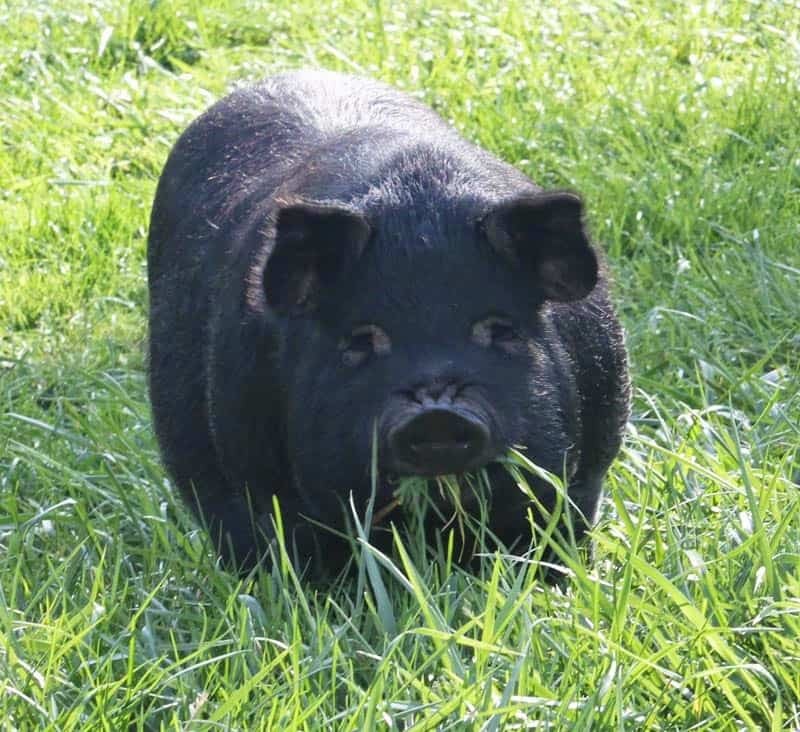 If you’ve decided to add pigs to your homestead, the next question is, “which breed?” I am partial to the heritage breeds because they do well on pasture. Initially we raised Tamworths, which we purchased from a breeder in the spring. We’d raise them through the summer and butcher them in the fall. For a variety of reasons, I decided I wanted to start breeding my own pigs, although I was very intimidated by the size of full-grown Tamworths and other breeds of pigs that I’d met. Introducing … the American Guinea Hog! Its history is as mysterious as they come, but one thing is clear — it was the homestead hog of choice in the southeast U.S. during the 1800s. Less than a decade ago, it was almost completely extinct with less than 150 breeding animals known to exist! Today it is enjoying renewed popularity, and its numbers have been rapidly growing over the past few years. Why? It’s less than half the size of most hogs! While many breeds of hogs can get up to 800 or even more than 1,000 pounds, the AGH adult weight is usually in the 250 to 300 pound range. This small size was one of the reasons it almost became extinct. It definitely did not fit into the factory farm environment. However, that small size is exactly what makes it attractive to homesteaders and small farmers. It has a sweet personality! Pigs have a reputation for being vicious omnivores, killing and eating chickens that are unlucky enough to wander into the pig pen, and some have even been known to kill people. Guinea Hogs, however, have a very calm, docile nature. While this may not be important to huge confinement farmers, it is very important for small farmers who will be working closely with their pigs and who have other animals and don’t want to worry about the pigs killing them. Of course, there have been a few Guinea Hogs that were not so docile, but most breeders are quick to send them to meat locker and not use them for breeding stock, ensuring that the breed as a whole continues to have a great personality. It grazes! While some heritage breeds of pigs will eat grass when on pasture, the AGH love grass and gobble it up as voraciously as if it were eating chocolate truffles. It has lots of lard! Although the average American consumer began to reject lard after the invention of Crisco, many people are beginning to realize that they were duped by marketing and that lard can play a role in a healthy diet. 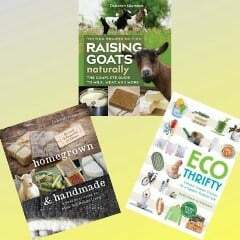 If you are interested in self-sufficiency, having pigs is the easiest way to produce your own cooking fat. Although you could grow sunflowers, corn, or soybeans, extracting the fat is a big project. Rendering lard can be done in a slow cooker or in your oven without purchasing any fancy equipment. It has outstanding flavor! Chefs have begun to sing the praises of the Guinea Hog from South Carolina to Chicago. One chef called it the Kobe beef of pork. It is especially popular with chefs who want to use the whole pig from snout to tail, and it makes excellent charcuterie. Confused piglets trying to nurse from our boar while he’s napping! 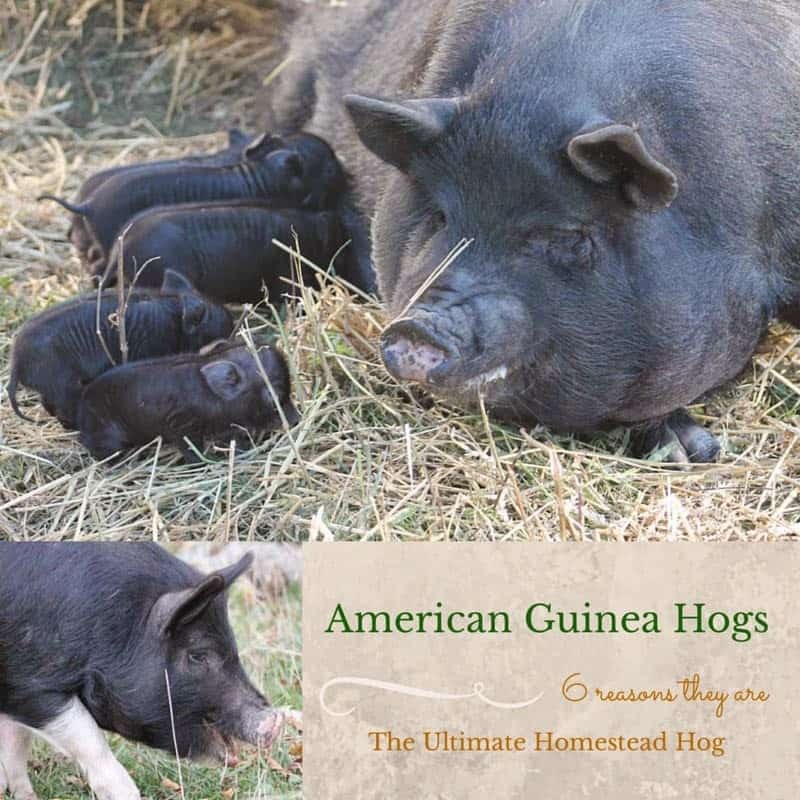 Because of all the unique strengths and benefits of the American Guinea Hog, they are easier to sell than other breeds of hogs, which is a sixth benefit for those of us who can’t eat all of the pork that our pigs produce. Their small size makes them more attractive for urban dwellers to purchase as a whole hog, which is the easiest way for a homesteader to sell a pig. You simply have to find one customer who purchases the pig from you, and then you take it to the processor as a courtesy to the buyer. You get paid for the pig, and the buyer tells the processor how they want the pig cut up and processed and pay them directly. Because you are not selling meat — you sold a live animal — you don’t have to deal with getting a license to sell meat, nor do you have to have an expensive freezer for storing meat, waiting for individual customers to come buy it, one pound of bacon and one ham at a time. When we raised Tamworths, a lot of people would only want half a hog because they couldn’t wrap their brain around the idea of having 175 or 200 pounds of pork! With the AGH dressing out at half that amount, the number of customers is greater. Of course, the four reasons I gave for having pigs on the homestead a couple of weeks ago is also true for the AGH. That means there is a total of ten reasons to have American Guinea Hogs on your homestead! With the number of registered AGH in the US now well over a thousand it is much easier than it was a few years ago to find breeding stock, although if you are just planning to raise them for meat, you don’t have to buy registered pigs. And if there are not any in your area, piglets can be shipped by air just like dogs and cats, so you can find a breeder in another state and have the pigs shipped to you. Since you are charged by weight or kennel size (depending upon airline), it’s a good idea to buy pigs that have just been weaned, so you can save on shipping costs. If you are interested in getting started with AGH, check out the Breeder’s Directory on the website of the American Guinea Hog Association. You've convinced me! I was going to go with Tamworths but I know how big they get. Thanks! I'd never really thought about pigs (in spite of the fact I love bacon, sausage, ham, pulled pork,….etc.). With a grazing pig that won't attack birds or our dog and cats, and won't grow to be as big as my little Jeep, we could have the best of all meats! 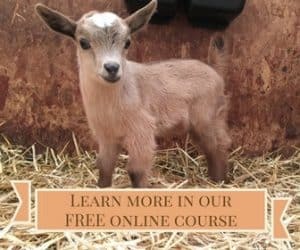 I also want to raise some pygmy goats. Do you know if thepigs and goats get along ttogether? AGH get along with all types of livestock that we've seen. They've happily co-existed in a pasture with goats, chickens, ducks, turkeys, sheep, cattle, and a llama. I have Guinea Hogs on my homestead. The boar rules the pasture. We have goats chickens ducks and Dexter cows. The boar does make sure his hurd has everything they need, he has not hurt any of my other animals but I am going to separate my cows from pigs. Goats have no problems at all. I live in Southeast Iowa and will have piglets for sale in late spring! How much for piglets? Gilts & boar, different bloodlines? I have Guinea hogs and goats and Dexter cows in the same pasture. The boar does rule!!! He never bothers my goats at all sometimes he does chase the cows out of the barn. He is friendly to me and all the other pigs chickens ducks cats dogs. I think he just is showing dominants. Very good with the pigglets! I have AGH. We love them. We live in Ohio. They get along well with other livestock, are friendly, graze well, are easy to handle and produce the best tasting meat and lard. BTW, we have a litter ready to sell. Email me for more information. im very interested in buying some from you. I live in Indiana. I will send you an email. We are in Western Oklahoma with piglets and young adults for sale! How much for piglets, gilts & boar? From different bloodlines? I just got American guinea hog how do I potty train her? Is that even possible ? I have heard of people house training pigs, but personally I think they should be outside. They are also happier when they have another pig friend. I have a one year old AGH that I have had since she was 2 months old. We have always treated her as a pet – but not in the house as she does have a very nice stall with paddock. Dixie has always displayed very sweet and sensitive personality traits, but in the past couple of weeks she has been getting more and more aggressive. She doesn’t seem to feel poorly, she is eating well and looks good, but yet she is getting very aggressive to me, my dog and even ate one of our chickens! Last night, completely unprovoked, she grabbed my let and bit clean through my jeans! My vet said sows can get aggressive as they age – anyone else have this issue? Any recommendations? I’ve never heard of this happening with an AGH gilt. If you don’t have any other pigs, it could be that she doesn’t have anyone who speaks her language. It’s always a good idea to have at least two of any species so they have a friend. It really is not a good idea for an animal to start to think of you as one of their herd because their ways of communicating can be dangerous for us fragile humans. Your vet’s experience is probably with commercial sows in confinement, and they are a totally different animal — plus they are not being raised in a natural environment. We have 30 we are trying to sell. Eliminating them due to health reasons. Are they registered and where do you live? We are brand new to guinea jogs and bought a brother and sister to raise for meat in June. They have been doing great until all of a sudden our girl started acting like she was blind. She won’t lift her head much and just puts her nose down in the hay in her shelter. She still wanders and seems to graze and eat the food we bring right to her. Has anyone ever heard of anything like this? Her brother is still perfectly fine. I have never heard of that happening. You might want to check with a vet. You could also mention it on the Thrifty Homesteading Facebook group to see if anyone there has experience that with pigs. If she seems unhappy or isn’t gaining weight, you might want to butcher her early. Are there any AGH in Arkansas, Ft Smith area? I’ve been raising AGH for three years. While I enjoy the small size, it does take much longer for them to get to thier smaller slaughter weight. I slaughter at 18-24+ months and get 80-100lb hanging weight. It’s much easier for one person to deal with. They are fairly docile, but the market in Virginia and Carolina has gotten saturated, so selling the extras has become difficult in the last year. I’m practically giving them away, still few takers. I have a unrelated gilt and boar ( under a year old) that I would like to breed. Can I keep them in the same pen, after she is bred? Should I separate once piglets born? When we only had one pair, we let them stay together all the time. While this is not true of all hog breeds, AGH boars are very docile. 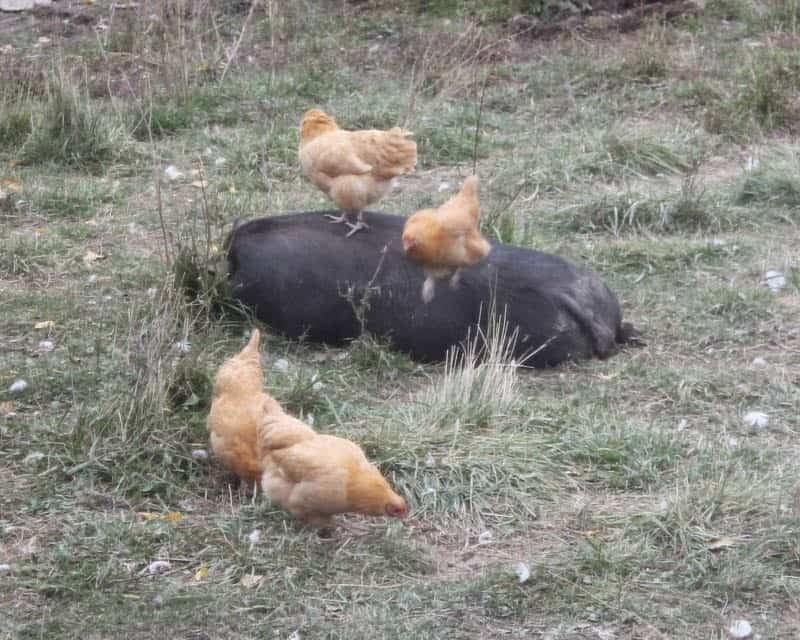 Did you see the picture of the piglets trying to nurse off our boar while he was napping? I will also add that we do not wean our piglets. We let the mamas do that, which they do around 3-4 months. If you remove piglets for forced weaning at 2 months, the sow usually comes back into heat within a day or two. Thank you very much!! So when we put them together, will there be endless matting activity, until she is pregnant ? 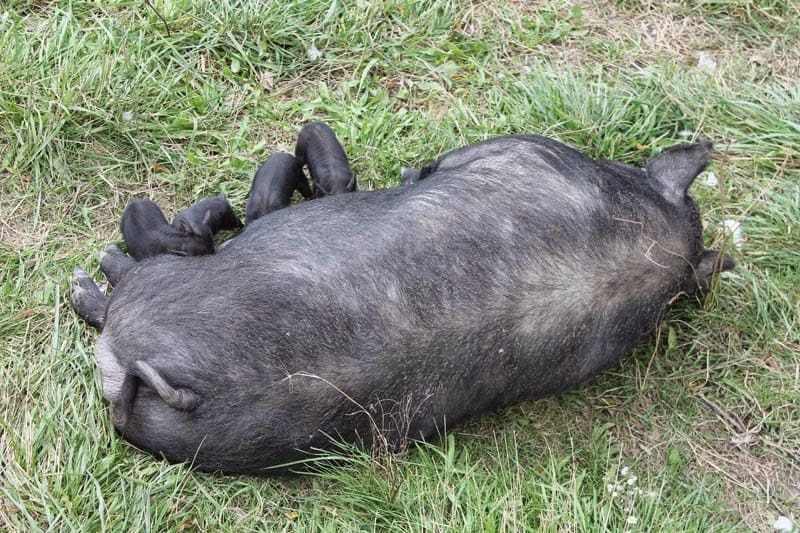 We had two young boars, and they mounted each other frequently…to say the least. I totally agree with letting Mother’s nurse until they are done!! Makes for much happier and healthier piggies!! Sows will only let the boars mate them if they are in heat, and like most livestock, it’s only for one day about every three weeks +/- 2 days. They will be very active on that one day, however, so if you’re around at all, you’ll see it (and hear it) and can mark your calendar. You are fabulous, thank you!! We live in the Interior of British Columbia, Canada, and have had quite the snowfall this year! Temps are warming up, so will put the 2 together in late March. Will let you know the outcome. Very excited!! There are very few AGH in my area. If I am just buying feeders, what would be the difference between what would be 5-6 agh’s or 2-3 large blacks, berkies, or a heritage cross? The upfront cost would be less for the larger pigs due to pricing per pig and the feed consumption would be somewhat equivalent due to the fewer numbers. I also only have to slaughter and dress fewer animals on the back end. Any thoughts? If you are just looking for pork, and you don’t mind dealing with larger hogs, then go with the larger hogs. The six advantages I outlined in this post are the reasons to get AGH. It’s not about cost. What a great comment page! We raise AGH’s in Northeast Kansas and just had a litter. Very friendly and the meat is the very best. I too am in NE Kansas, and would like to have a chat with you about these AGH for my farm. When you say you’ve “been bitten by the AGH,” I do hope you mean metaphorically, as AGH are very docile. Your feeding plan sounds good, although a small pig probably couldn’t drink a whole quart of milk before they’re 25 pounds. I always say watch your animals. If they are growing well without excess fat, then you’re doing a good job. If they are dragging their belly on the ground or have trouble standing up from a laying down position, then you’re feeding too much grain. How many AGH to graze per acre. Rich in grass, clover, etc. 3, 6,12. I have no idea. If you do more than about six per acre, they’d probably start rooting fairly quickly. I have 2 gilts from the same litter, now 2 years old. They run up to me when I’m out in the pasture with my goats expecting food. If I don’t have anything for them, they mouth my boots. One of them bit at my leg pretty hard, but didn’t pierce my jeans or skin. Can I train her not to do that? I smacked her on the flank, but that made her angry, and she kept mouthing my boots. Should I stop feeding them and let them just graze? Maybe they’ll leave me alone if I never have food? If you stop feeding them they will become malnourished. They cannot survive on pasture alone, and if don’t feed them, they will just be even more hungry when they see you. That is not a typical AGH personality, and I wouldn’t want to breed a pig that’s aggressive because she might pass on her aggressiveness. It’s normal for pigs to be pushy, but they should not be biting at you. If you have ever hand-fed them, that can cause problems like this with some, so you should always feed them in a pan or on the ground. Now how do you keep them in? I heard hogs are very hard on fences, do you use or have you ever heard of anyone having luck with an electric fence? Pig panels work, as well as electric. Just be sure the electric is high enough that they can’t pile dirt on it when rooting. Single strands work, as well as the pig netting from Premier1. Don’t use the poultry or goat netting because it’s too close to the ground, so they can bury it.